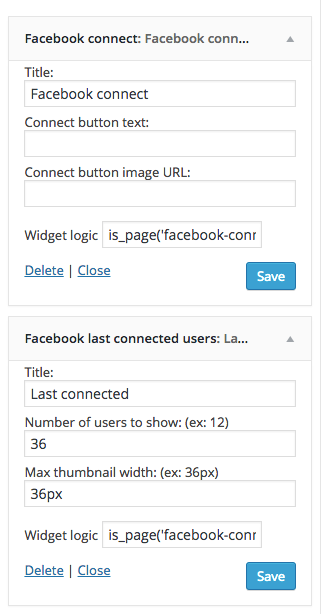 This Facebook Connect plugin for WordPress enables you to add the Facebook Connect functionalities into your website. This feature would allow your visitors to create a new WordPress account if they are not connected, or attach their Facebook account to an active WordPress user if they are already connected. No more need for your users to remember their username / password. They can just connect securely in a click of a mouse with their Facebook account! 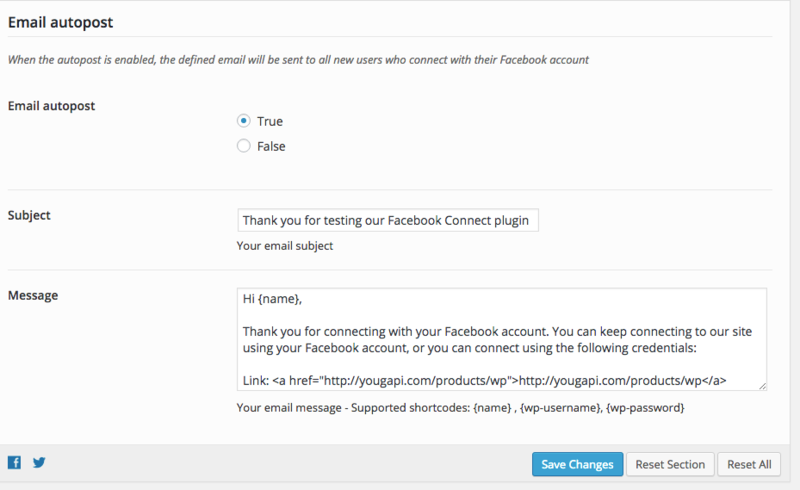 This plugin also provides a way to get your users Facebook email (that has usually been verified). You can export your users data and emails in a CSV format. You can also define an Autopost Email Message that gets sent automatically to all the users who connects for the first time with their Facebook account. - Ability to connect in one click with a Facebook account. - Your visitors can create a WordPress account using their Facebook credentials. - Ability to attach a Facebook account to your WordPress admin user. - Get your users Facebook email and store it into your database. - 2 Widgets (Facebook Connect and Last Connected Users). - Customize how many users are displayed in the widgets. - Ability to display the Facebook connect button in your theme (using a PHP code provided in the documentation). - This plugin users data can now be exported and imported directly into our standalone Facebook Viral app for more advanced features in posting on users wall. - Updated the plugin with the latest Facebook API changes. - Fixed a bug preventing the connected users icons from appearing in the plugin settings. - Added support for Latin characters when posting status on users wall. - Added the ability to create the username based on the user’s Facebook first and last name. - Added the ability for the blog admin to activate the auto post of a custom message on user’s wall when they connect the first time. - Ability to connect/disconnect a Facebook account from the user profile page. - Added a better Facebook connect image and improved the Facebook connect features. - Ability to display the Facebook connect in posts or pages with a shortcode. - Added an option to customize the widgets titles. - Ability to display the Facebook connect button anywhere in a page (header, footer…) by calling a specific function. - Ability to create a new WordPress user using Facebook. 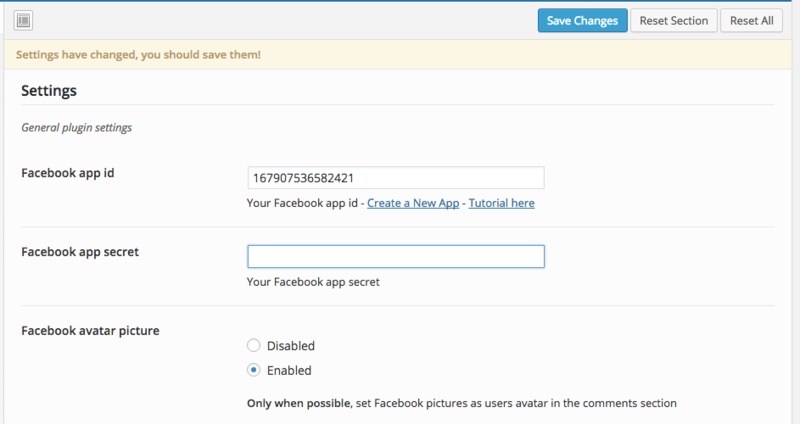 - Ability to attach a Facebook account to an active WordPress user. - Created 2 widgets (Facebook login, last connected) instead of one for more flexibility. Please make sure you try the plugin with a default WordPress theme (ex: Twenty ten) to make sure it works properly. Some themes are not coded properly and doesn’t always respect the official best practices for themes development, and can cause some plugins to not work properly. Knowing that will help diagnostic any problems you could have making this plugin work as expected.